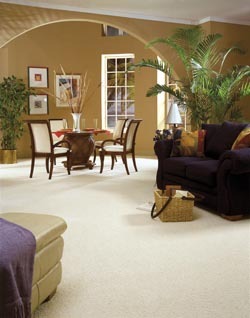 As a premier carpet store in this community, we make it a point to offer the best assortment of options. You are sure to find what you need when you browse through a showroom featuring endless colors and a variety of textures of carpet flooring in Anderson, SC. This locally owned and operated flooring showroom offers wholesale carpet plus installation. If you’re ready to remove and replace outdated carpet, pay us a visit. You can rely on our help every step of the way when you decide it’s time to give your home a more modern look. Our collections of discount carpets are varied. With so many options it’s easy to find the style that can fit with your home décor. At our showroom, you can expect affordable carpet prices and a group of designers that are passionate about creating dynamic home interiors. When you sit down for a consultation with one of our thoughtful representatives, you can learn about the many benefits of carpeting in your home. Create a comfortable environment that your family and friends will want to spend time in. Carpets naturally soften any noises in a room, so each of the conversations you have with friends will be more enjoyable. Find a texture that works for your particular approach to style, and set your home apart from the others on your block. When you make time for a consultation, one of our experienced flooring specialists will guide you through our inventory of premier carpeting. We’ll listen to your expectations and present several options for you to preview. With so many options to choose from, many customers find it easy to become overwhelmed. That is why we take the time to work with you personally. Our priority is to match quality recommendations with your flooring requirements. Whether you’re interested in strong or elegant carpet, we’ll find it for you! We provide personalized attention and choices that are sure to complement your living space. We understand the level of investment you have in your home. Each of the design professionals that are a part of our staff is trained to identify the best choices for your particular design plan. Depending on the budget you have to work with, our competitive pricing could make the home of your dreams a reality. Frieze: Choose this cut-pile carpet that is made with springy and bent fibers. Families appreciate the way it hides dirt while maintaining an exceptionally soft feel. Marine: This product is specially designed for marine environments, including docks and marine facilities. This carpet is fade and mold resistant for added value. Set sail in style with this environmentally-durable variety of carpets. Shag: A deep-pile carpet that features long-yarn and low-density strands that lie in different directions. Make any room an inviting destination with this classic approach to carpet. Berber: Enjoy an aesthetically-pleasing and durable carpet product that is ideal for areas with heavy traffic. Our Berber carpet is woven with looped and uncut yarns and is available in luxurious higher piles and lower, tightly-constructed piles. You deserve a flooring store that offers you superior customer service as well as outstanding products. We provide you with the best of both worlds when you choose to make an investment in carpet with our store. Our local ownership allows us to be more attentive to your individual needs. We are also a member of a national retail flooring group with a tremendous level of buying power. This allows us to carry a broad selection of carpets from many of the names you have come to know and love at prices you cannot afford to pass up. This association means our design and sales teams have undergone an intensive level of training that will be clear to anyone who sits down for a consultation. Our support for your redecorating project doesn’t stop once you have completed your carpet purchase. Getting the best fit possible for your carpet investment can make a big difference, and our carpet installation team is ready to make that a reality. When you consider the competitive rates and proven performance that our contractors bring to the table, the choice is obvious. Our professionals treat your home with the respect it deserves, and we won’t waste your valuable time with needless delays and hidden charges. Start your design journey at our showroom today and save a great deal of time and money along the way. We proudly serve the communities of Anderson, Greenville, Easley, Clemson and Seneca, South Carolina.